So, you’ve finally decided to purchase that brand-new mattress you’ve been dreaming of? A smart choice, particularly when you consider the positive impact the right mattress can have on your health. That, combined with the fact that many people, without realizing it, sleep on a mattress that should have been replaced years ago. Depending on the kind of mattress purchased, the sleeping patterns of the user and the quality of materials used in its construction, the useful life of a mattress generally falls around seven years, give or take a couple years based on its use and treatment. Any mattress that has been regularly used for a time frame beyond that has more than likely lost the support qualities a proper mattress is supposed to provide. And while no mattress will last forever, there are ways to maximize its life and maybe even get a couple extra years from it as well. It is often incorrectly assumed that a mattress can be placed anywhere and function as a comfortable and revitalizing sleep surface for years to come without lifting another finger. But like many things in life, you get out what you put in. With the cost of some mattresses, their impact on your life and the difficulty some people have finding the right one, wouldn’t it make sense to do whatever it takes to maximize your investment? Luckily, many of the ways you can take care of your mattress are simple and may even be things you are already doing. If you happen to be one of those progressive individuals, congratulations! If you aren’t, there’s no need to be glum; we all need to start somewhere. Because of that, we at The Foam Factory have put together a list of five easy-to-follow suggestions for maintaining and protecting your mattress so you can continue to get a great night’s sleep for years to come! 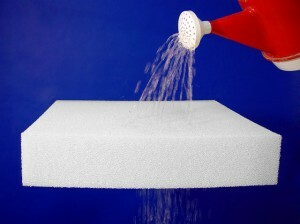 If a dry environment is a mattress’ best friend, moisture is its arch enemy. If you sleep on a conventional innerspring or foam mattress, moisture is the fastest way to cut your bed’s life in half. While not eating and drinking in bed may seem obvious, even with all the people who continue to do so (surely, you aren’t one of them), there is more that is meant by this suggestion. Of course, that isn’t to say you shouldn’t try to avoid spilling a bowl of beef stew on your bed at all costs. Specifically, this first tip is in reference to the moisture our bodies generate every night. It may be a result of the room’s temperature, your own temperature, dreams, weather, stress, health conditions or something else, but no matter why it happens, we all generate moisture while we sleep. As this happens, it is trapped in our bed by our blankets and our bodies. You probably don’t wake up every morning feeling drenched, but that doesn’t mean there isn’t moisture in your bed going unnoticed. Because this gentle perspiration is inevitable, it’s suggested to leave your sheets back and your bed uncovered for 30 to 60 minutes after getting up. Immediately making your bed can trap residual moisture that may, over time, be the beginning of a moldy, musty or mildewy mattress. If you’re one of those free spirits who feel no need to make their bed every morning, fluffing pillows and tussling your blankets a bit can help release any trapped, residual moisture as well. This is particularly important during the summer months or if you live in a humid environment. Humidity already present in the air makes the evaporation of sweat and moisture more difficult, meaning even if you keep your bed uncovered for a while, it still may not have dried fully. Targeting a fan at an uncovered bed in the morning can help with this process, whether you live in a humid area or you just want to be extra-sure your mattress stays dry. We all have the ideal “warm and cozy” bed in our minds that we like to imagine climbing into at the end of the day. But to keep that bed warm and cozy, we need to make sure that it stays dry as well.